Art Licensing shows or in most cases trade shows that include a section devoted to art licensing requires that you have legitimate credentials (buyer, press, exhibitor, etc) to attend. Some will allow artists/designers to attend but may require a fee. Which one you want to visit or exhibit is dependent on what type of manufacturers you are targeting your art. Exhibiting at these shows are expensive and a 10 by 10 foot booth can cost up to $4500. Exhibiting at the CHA winter show is the least expensive. Below is a list of the shows. 5. Licensing section at the Print Source New York show (New York) held in January. The licensing section was established for the first time in 2009. The main emphasize of the show is to sell textual and surface designs. Update 2012: This show no longer has a licensing exhibitor section. 6. New York International Gift Fair is held in late January. The Licensing Gallery is a small area of 32 booths that was established to give some of those exhibiting at the May Surtex show the opportunity to exhibit at an earlier show. January 29-31, 2011 at the Javits Center. Update 2012: This show no longer has a licensing exhibitor section. Advertising can be expensive and I am often asked if I get licensing deals or leads from the ads that I place in art licensing magazines. Other artists and agents may have a different experience than me but I've never closed a deal from an ad. And I've only had a handful of manufacturers actually contact me expressing interest in my art because of an ad. Why do I then place ads? My reason is for exposure. I want licensees to recognize my art and in my opinion this is an excellent way besides getting my art onto products. I also submit press releases but there is no guarantee that they will be published. The three magazines devoted to art licensing are Total Art Licensing, Art Buyer and Art of Licensing. All publish digital copies besides hard copies. Note: The most reasonably priced ad of the three is Total Art Licensing at $275 for a half page. Art of Licensing (a supplement to License! Global magazine) is published by Advanstar twice a year in May and June. Exclusive Art Licensing Agreements - Should You or Shouldn't You Sign Them? An exclusive licensing agreement is when an artist agrees to license her/his art with only one manufacturer in a particular industry. Many fabric manufacturers and some greeting card manufacturers ask for exclusive arrangements when they plan to license an extensive amount of the artist's art. Of course there are other manufacturers that ask for exclusivity and the more well known an artist is the more exclusive licensing deals are offered. The pros in doing an exclusive is that the artist has a licensing deal already in place with the possibility to license a lot of art. Because collections of art are offered by one manufacturer in that industry, the artist gets more visibility and a chance to build equity in their brand. The con is that the licensee may not choose everything the artist creates and the artist loses opportunities to license the rejected art in that particular industry. Should an artist sign an exclusive agreement or not? The answer is that it depends. There are many view points on why and why not to do exclusive licensing agreements so I suggest that you do your research and ask as many artists/agents as you can in order to make the right decision for yourself. A good place to start is to read an excellent article by artist Tara Reed "To sign an exclusive license - that is the question" posted on her blog (http://artlicensingblog.com/index.php/2009/08/28/to-sign-an-exclusive-license-that-is-the-question/). I consider the free transform command the most versatile tool in Photoshop. I use it constantly to size, distort/shear, and rotate images. The following steps shows you how to shear horizontal formatted art for a placemat mock-up. Similar steps can be used to shear art for decorative flags, gift bags, and box mock-ups. In my mock-up example at the left, I placed a mug (created in Photoshop) on top of the placemat to better show what kind of product it is. You could also put silverware next to the placemat. Hint: I placed the art behind the mock-up because it isn't easily visible in the mock-up. This is a good practice when sending out tearsheets to manufacturers. 1. Place the horizontal image in a separate layer in Photoshop. form command (Mac = Command + T; Windows= Ctrl + T). A rectangle appears on top of the art that has small squares in each of the corners and middle of each of the sides called handles. Hold down the Command key (Windows = Ctrl key) and drag the center top handle to the right and down to shear the art. Note: If you are not satisfied with the shape (the dimensions/angle of the art looks wrong), adjust it by using the corner handles. Push the enter button to complete the command. It's that easy. You now have a placemat mock-up. Below are other examples of mock-ups that can be created using the free transform command. Put the vertical art and mock-up flag pole (drawn in Photoshop) into separate layers. Place the art on the top layer over the flag pole layer and use the free transform command to shear the art. Put the art and mock-up boxes into separate layers. For this example there are three art layers and three box layers. Use the free transform command to rotate the art on top of the box (move the cursor outside the bounding box and drag). Then shear a square formatted art onto the square box, a horizontal formatted art onto the horizontal box, and a round formatted art onto the round box. I created the three shapes of boxes in Photoshop for use in my mock-ups. This is a two part article because it is long but it is a must read for artists wishing to license their art. Recently there has been some posts on the Art of Licensing yahoo forum (http://groups.yahoo.com/group/TheArtofLicensing/) about how hard it is to license art. I know I have found it a continual struggle to license my art. When I first started licensing, I was turned down time and time and time again when I was looking for an agent. I decided to educate myself on art licensing anyway I could when I didn't get anywhere in licensing my art by myself. I searched the web for articles about licensing, subscribed to licensing magazines, went to seminars, listened to audio CDs but nothing seemed to help. Then I discovered art licensing coaches (http://joanbeiriger.blogspot.com/2009/08/on-art-licensing-coaches-consultants.html) who helped me understand the quality, type of art, and marketing materials that I needed to compete in the art licensing industry. The main point of the above discussion is that I didn't give up. I also grew a thick skin when I was told that my art wasn't suitable for a certain type of product or that it just wasn't good enough. I didn't take the comments personally and I listened to what was said. I improved my art, created collections, and did mock-ups. Now I have an agent and I am finally going somewhere. I'm not alone in my mantra to not give up a dream. 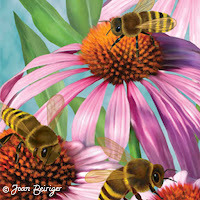 Read what Barbara Johansen (artist and writer ) and BJ Lantz (illustrator and designer) have to say. Their comments are well worth reading! There is really no field in the arts that is an easy one and that does not meet with obstacles and challenges. In that way licensing is no different from writing or illustrating. All of those arts depend largely on someone buying what you produce; you have to figure out what the particular markets seek and satisfy those needs. But I do think that tenacity is equally as important as talent. I've seen a lot of wonderful talent go to waste when an artist gets easily discouraged or does not have a thick skin. My advice to anyone just starting out as a commercial artist (illustration and licensing) is to just get going and get tough, because the competition and art directors and editors can do a number on your ego if you do not understand the artist/client relationship. One should never give up on one's dreams. There are just too many examples in the arts of people who kept hearing "No" over and over again, but kept going. Then finally someone says "yes"--and magic happens. My advice: keep learning and keep trying. Barbara makes a good point about having a thick skin ~ no matter what kind of artist you are. And it is certainly very much of an asset to have thick skin in this business (Licensing) because it is just that: business. It is not personal. Just because your art doesn't get picked (time after time after time), doesn't mean it isn't good or that the clients don't like you, it could just be that the timing isn't right for it or that it is not at all what the clients are looking for. I have one licensee right now that I have been doing very well with that it took FIVE YEARS of meetings & submitting art to get the first deal with them. Finally, I have what they're looking for and we've done several projects together. And let's not even start in on how much patience you have to have to see the unknown amount of money you might make from these licenses once they are signed. And then there are the licenses, through no fault of your own, never make it to production. Another point is not to get too attached to or fall too in love with your own work to the point that you won't compromise. I have clients ask to change colors (sometimes the entire palette of a collection) or take out an item, etc. My philosophy is: You want blue rather than pink? What shade of blue would you like? I'll make it happen (even if I happen to think it looks better in pink). Because I understand that this is business and they know what color will work and sell for them. Unfortunately, Surtex does not sell CDs of their seminars and the Licensing Show no longer sells them but CHA (Craft & Hobby Association) does. If you haven't attended CHA seminars, then you can at least purchase audio CDs of them. The yearly winter CHA show have seminars on many subjects such as marketing for retail shops, craft related, color trends, art licensing information, etc. CHA sells the sessions on CDs packaged by the year at $100 a pop (http://cha.impactlearning.org/store/provider/provider09.php?sessionid=4f617c5e837780b81dcbf905e0059940-17708898#blank). In other words, you have to buy the entire package even if you are interested in only one of the sessions for that year. However, 2007 seminars and older are still available from the company that previously recorded the sessions (iplayback.com) and they can be purchased individually from them. Note: You are not losing too much in not buying the later years because in 2008 only a few sessions on art licensing were given and none in 2009. I recommend listening to the following three sessions from iplayback. Even though these sessions were done several years ago, the information given are still right-on for todays market. The CDs are reasonably priced at $12.50 each. Go to http://www.iplayback.com and search keywords such as licensing or trend forecasting for a list of all the available sessions with those titles. Search by the session number to get ordering information on my recommended sessions. Session # 356 -D501: 2006 "Effective Marketing Strategies for the Art Licensing Business" by art director Joanne Fink. This session covers a lot of details on building art collections. Unfortunately you don't get the visuals to see examples of the art and collections but I still find it very useful. Session #356-D503: 2006 "Tips of the Trade:Licensing Your Artwork in Different Industries" with art director Joanne Fink, illustrator BJ Lance, artist Carol Eldridge, agent Susan Cruise, Meryl Taylor from CR Gibson, and Ray Markow from Santa Barbara Designs. This is a great session that answers many art licensing questions by a well rounded panel of art licensing experts. Session #357-S118: 2007 "Secrets of Successful Trend Forecasting" by Ray Markow from Santa Barbara Designs. Great resources and ideas on predicting art trends. When you are stuck and need some inspiration for your next painting, check out the items in your home. Don't just think of a bowl as something to put your cereal in, or that is the plate I got from Crate and Barrel, or that mug is a design licensed by Mary Englebreit. Look at the texture on items in your home, the way light shines through the glass, what great reflections are on a pot, or the brilliant color combinations in a piece of fabric. Maybe that is all it will take to get your creative juices flowing again. Check out Kate Harper's article on "Need Card Design Ideas?" (http://kateharperblog.blogspot.com/2009/08/need-card-design-ideas.html) to see what she found in a 10 minute walk through her home. I betcha you also have some great inspirational items hanging around that you didn't know you had! Stripe patterns used alone or with other design elements seem to be a staple for art on products. Although plaids are no longer as popular as they were a few years ago, they are still consistently used for some products such as fabrics. A plaid pattern is a great addition to a fabric collection. Of course, there is nothing better than hand painted stripes and plaids but if you need them in a hurry or don't want to paint them, they can be easily created in Photoshop. The following steps shows you how I create stripes and plaids. Note: This method can also be adapted for use in Adobe Illustrator. 1. Make sure that the layer window in Photoshop is open. On a new layer create a series of stripes. To do this, select a vertical area in the Photoshop window using the marguee tool and fill the selected area with the desired color by using the paint bucket tool. Continue creating stripes with different colors and widths and place them adjacent to each other until you have a band of stripes. 2. Move the stripe band to the left of the window. Duplicate the layer (Mac = option key, Windows =alt key) and drag it next to the first stripe band. Do this until "almost" the entire window is filled. You now should have multiple layers of stripe bands in the layers window. 3. Select all the stripe layers in the layers window and use the align vertical centers command that is located on the options bar (Mac = across the top of the window) to line up the stripes. 4. Merge the layers (Mac = command + E, Windows = Ctrl + E) so that you now have only one layer with a block of stripes. 5. Select the block of stripes with the free transform command (Mac = command + T, Windows = Ctrl + T). Hold down the shift key and pull the corner to enlarge the stripe block to fill the window. You now have your own original repeating stripe pattern. 6. To create a plaid by using the stripe pattern that you created above, duplicate the layer and drag the pattern. A new stripe block layer is now on top of the original layer in the layers window. 7. Reduce the opacity of the new layer to 50%. 8. Rotate that layer 90 degrees by selecting the free transform command, hold down the shift key and rotate the layer clockwise or counter clockwise until the stripes are perpendicular to the the stripes on the underneath layer. 9. Line up the two layers by selecting both layers in the layers window and use the align vertical center and align horizontal center located on the options bar. Voila, you now have your own original plaid pattern! Many artists won't submit art when a manufacturer sends out a design request to hundreds of artists and agents (cattle-calls). They say that the competition is too stiff, it's too much work on a short notice, and the likely hood that their designs are chosen are nil. That may be true but there are still rewards in doing cattle-calls. In my opinion they are: 1. You'll find out what art themes the manufacturer are looking for and what time of year they are looking for particular designs. Eventually you'll see a trend in the themes that most manufacturers request. You can then concentrate on designing the popular themes to improve your chances of getting your art licensed. 2. Cattle-calls gives you a chance to design themes that you normally don't do. You just may find a home for the art even if it's not with that manufacturer that initiated the design request. 3. Cattle-calls gives you a deadline to work toward. I know that I am focused and accomplish more when I have a deadline. 4. Cattle-calls are a good way to increase the amount of art in your portfolio. 5. Manufacturers will become aware of your art and may contact you later when they need art for their key account clients. Hint 1: After receiving a request for submission, the first step you should do is get on the internet to find out what style of art the manufacturer is looking for. There is no use submitting art to a manufacturer that is looking for whimsical art styles and you only do fine art. If the manufacturer doesn't have a website or doesn't display licensed art on their site, you may find their products on retail store sites. Hint 2: If you don't have an agent passing cattle-call requests to you, contact manufacturers to see if they periodically send out call for designs. Request to be put on their list if they do. I finally had two designs licensed by submitting to a cattle-call. As agent Jim Marcotte of Two Town Studios said in his blog article "So Where Did it Go?," submitting art to cattle-calls is a numbers game. The more art that you submit the better chance you have in getting deals. Product mockups in the art licensing industry are examples of what art looks like when placed on products (dishes, mugs, aprons, decorative flags, gift bags, clothing, etc.). The mockups can be art placed on actual products or can be created digitally with a computer. Making mockups of your art takes time away from creating new art so that you may be reluctant to do them. But there are several reasons for making mockups. First, mockups are a great marketing tool because not all manufacturers have the vision to see your art on their products. Also your art will stand out from the competition when you have mockups and other artists don't. Second, it shows your professionalism in that you are willing to take the extra step. And third, if your art doesn't look stupendous/amazing/fantastic on the mockups maybe that art is wrong for that particular product or "gasp" it isn't good enough or suitable for licensing. The Warp command in Photoshop is really useful for placing art on curved surfaces. The following steps shows you how I use that command for bending my art around a mug for a product mock-up. 1. In Photoshop, put an illustration of a mug and the art to be placed on the mug in separate layers. The art layer should be above the mug layer. 2. In the layers window, make the art layer 50% opacity. Move the art on top of the mug and resize it (Mac = command + T; Windows = Ctrl + T) so that it fits on the mug. 3. In the art layer, select the wrap command (Mac = command + Shift + R; Windows = Ctrl + Shift + R). A rectangle appears on top of the art with horizontal and vertical bars inside it. The horizontal and vertical bars are used to move the art inside the rectangle. Hard to see handles in the corners of the rectangle can be pulled to manipulate the outside shape of the art. Note: When the warp command is first applied to art it is in the custom style mode and that is the style that I usually use. Other styles such as arc, budge, wave, etc. can be used instead by selecting them in the warp style pop-up menu on the options bar (across the top of the window on the Mac). curve the outside of the art to the mug's top and bottom dimensions. The art that is not on the mug will be deleted later. Move the warp horizontal bars downward to curve the art. This is especially important when you have horizontal borders in your art. You want the borders to follow the contours of the top and bottom of the mug. Note: It took me several iterations on using the handles and the horizontal bars to curve the art around the mug. 5. Go to the mug layer and use the magic wand tool (Mac and Windows = W) to select the outside of the mug shape. Go to the art layer and hit the delete key to remove most of the art that is outside the mug. To remove the extra art on the handle, use the rectangle tool (Mac and Windows = M) to select the area and hit the delete key. 6. Change the opacity of the art layer to 100% and ergo a mug mock-up! Watch youtube videos (http://www.youtube.com/user/thelicensingcoach) on licensing as Jeanette Smith (J'net Smith Inc.) talks about How to Stand Out, What it takes to Succeed, Have a Goal, etc. Jeanette Smith (http://www.jnetsmith.com) is an art licensing coach, offers teleEvents on art and character licensing and gives a free monthly Ask J'net Free Friday via the telephone. Last Friday my husband Bill and I went to a consumer Scrapbooking show to search for a digital cutter to make custom picture mattes for our miniature (dollhouse) business. 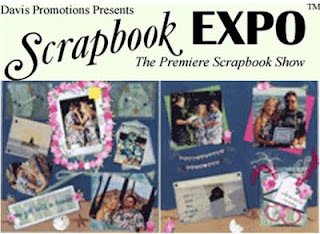 All I can say is that there are still a lot of scrapbook enthusiasts because the show floor was jammed with customers as well as the workshops and crop areas. Don't ask me what crop means because I'm not a scrapbooker but whatever it is there were an amazing amount of people working diligently at tables. I didn't see much in the line of paper for scrapbooking but did see loads of embellishments for scrapbook pages. I had heard that paper sales are down because scrapbookers are creating their pages on the computer and then using glitter, ribbons, stickers, stencils etc. to embellish them. We did find a great cutter (Klick-n-kut) but alas it is for Windows operating system only and we have a Mac. But we bought KNK anyway because it is very versatile, will cut small intricate shapes, and will even cut images created in Illustrator and Photoshop. So guess what I've struggled with the last two days? Software installation! I won't bore you with details in trying to use Windows when I am a Mac person or ALL the problems. However, the latest stumbling block is that somehow Mac's free BootCamp (allows Mac to operate Windows applications) isn't letting me get onto the internet so I can't register KNK. If I can't register it, I can only use it in the demo mode and thus can't save files etc. I called the company and unfortunately there isn't a work around. Grrrr! I have an appointment with Apple this afternoon to correct the problem - I hope. Sigh! Yesterday my husband Bill and I went to the San Francisco Gift Fair to look for items for our miniature (dollhouse) business. We create nature and ethnic art and sell them at miniature consumer shows. 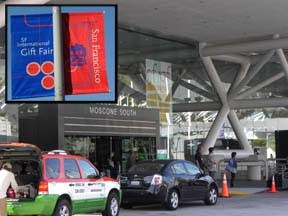 The SF show has shrunk so much that it didn't fill even one of Moscone's two exhibit halls and there was very little traffic. One of the dealers (lotion manufacturer) commented to me that they were surprised that any dealers came back because the February SF show was so bad. She said that the Los Angles show is also hurting but did say that they did really well at the last Atlanta Show but not as good as in previous Atlanta shows. While looking for items that we can adapt for dollhouses, I always keep my eyes open for trends in the giftware market and also what's new in licensed products. There wasn't much to see at this show because the only licensee that had a booth was Peking Handicraft (they are a SF based company) and even the few distributors present had downsized their booths so much that they had only a tiny sampling of products from each of their manufactures. The main Christmas themes shown were santas and snowmen. I guess it's true that manufacturers are staying with the tried and true motifs. There were a lot of images of Barack Obama on pillows, purses, and clothing. Robot images were on t-shirts, puzzles and toys. Browns, muted reds and oranges were prevalent for home decor and clothing. The only bright colors I saw were used in glass products (vases, ornaments, etc.) or dime store products. Note: We don't go to the offsite permanent showrooms because there are few manufacturers or distributors that carry licensed products or suitable for our miniature business. We also toured the Gourmet Housewares Show that ran in conjunction with the Gift Fair. It had quite a few tabletop booths but none with licensed art. Most tabletop had none or very little art on them and ranged from bright fiesta ware colors to white. 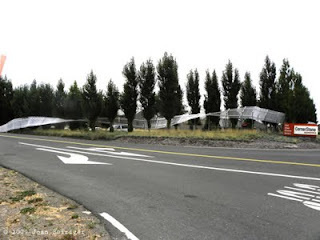 After I uploaded my video "Art Inspiration & More - Cornerstone Sonoma" to youtube, I checked the internet to see if CornerStone Sonoma has a website. Yep, they do. Then I thought oh, oh I better inform them that I uploaded the video incase they object. Although, I can't think why they would because after all it's free publicity. I got a quick reply back from my email. 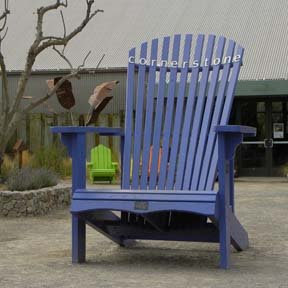 CornerStone has no objections and more over they like the video and want to use it in the visitors center to run as a continuous loop. Of course, I said yes because it's publicity for me. My name and website is shown in the video. I didn't realize that I'd have the opportunity for publicity in an atypical way. Hmm, I wonder what other marketing outside-the- box concepts I can come up with?